In previous blog postings I have expressed my concerns about the relative return on investment and the economic fairness of roof-top solar panels. But I am also a big fan of solar power which is, after all, the most abundant and the most reliable energy source that we have at our disposal. In this blog I want to draw attention to some encouraging news in the industrial development of solar power. I also want to point out a few very fanciful uses of solar power that I believe demonstrate some of the future potential of this resource. First, it is an exciting time to be involved with Concentrated Solar Power (CSP). With the commissioning of both the Solana Plant in Arizona and the Ivanpah Plant in Nevada over the next few months the global CSP generating capacity will almost double. The Solana Plant is particularly encouraging because it incorporates molten salt storage allowing the Plant to run for up to 6 hours after sunset. It is not the first plant to incorporate molten salt storage but it is the biggest. Half a world away CSP developments in North Africa and the Middle East are starting to gain traction. The Noor I CSP Plant broke ground in Morocco in May, 2013 with financial support from the German government. In the same month the Internationally backed Climate Investment Funds approved a revised plan for the rapid development of CSP in North Africa. This plan aligns with the Desertec Foundation’s vision of utilizing solar resources in desert regions to transform local economies while supporting a transition to sustainable energy resources. This year the government of Saudi Arabia made a massive committment to the development of solar power with the goal of converting most of the oil-fired desalination facilities in the Kingdom to solar power. That would provide some relief for global oil supplies (currently almost 2% of global oil production is used in Middle East desalination plants) as well as representing another very substantial increase in global CSP capacity. The only negative development in the world of CSP is the 180 degree change to support mechanisms for the development of this technology in Spain. Prior to 2013 Spain had been a world leader in developing CSP and is home to the two premier CSP engineering firms. However, the elimination of almost all financial supports for CSP developers in August, 2013 has led to a collapse of CSP projects in Spain. Luckily there continue to be many new opportunities in Africa, the Middle East and the U.S.
Photo-Voltaic solar panels have had more of a mixed year in 2013. Module prices seem to have bottomed out and the resulting price competition has led to the bankruptcy of a number of manufacturers. In jurisdictions where the penetration of solar panels has reached double digits as a percentage of normal load incentives are being cut back and in some cases regulatory barriers are being raised, most notably the capacity studies in Hawaii. In Arizona monthly service fees are being added to the utility bills for homeowners with rooftop solar panels. The many challenges facing PV solar represent a serious risk to the further development of this resource. Although dropping solar cell prices and associated reductions in margins are disrupting the supply side of the PV solar business these developments are making it possible to showcase solar power in ways never before possible. The team behind the Solar Impulse solar-powered airplane announced that they will attempt an around-the world flight in 2015 entirely on solar power. This well-funded and experienced team has been working for more than 10 years to make solar powered flight a reality. Solar Impulse is not the only game in town when it comes to harnessing the energy of the sun to power an aircraft. Flying somewhat under the radar is Eric Raymond and the team behind the Sunseeker series of aircraft. The newest member of the family, the Sunseeker Duo (shown above) is currently undergoing flight tests. It will be the speediest solar-powered aircraft ever built. It will also be the first to be able to carry a passenger. I would encourage my readers to visit these sites and if you like what you see consider making a donation which will help these organizations continue their ground-breaking work. 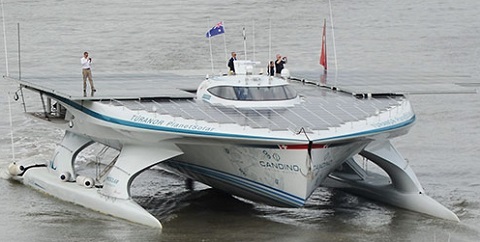 Shifting from the skies to the oceans, the world’s largest solar-powered ship, MS Türanor recieved a new life mission as a research vessel after completing the first solar-powered circumnavigation of the earth’s oceans. It has set off on a Swiss-sponsored voyage to study the seasonal changes in the behaviour of the Gulf Stream. These innovative applications of solar power demonstrate the potential of an energy source that can meet many of our current needs. Efficient and cost-effective energy storage remains elusive but with a dedicated global effort storage solutions will be developed. In the meantime it is interesting to watch as solar power moves from the hand-held calculator to powering transcontinental flights and beyond. Why Renewables Haven’t Destroyed the Grid – Yet! Most supporters of renewable energy development are probably pretty comfortable with the way things are going. Wind and Solar generation has been increasing both in "nameplate capacity" and in actual production of electricity. There have not been any significant grid failures that can be blamed on renewables. Apart from a consolidation within the solar cell manufacturing sector there have not been any notable bankruptcies within the electricity generating sector. All visible signs are positive for a continued expansion of renewable resources. When I talk to groups about renewable energy I start off with a Youtube video which demonstrates testing the compression strength of a concrete block. For 2 minutes and 40 seconds this is the most boring video you could imagine. The block shows absolutely no sign of stress. At 2:41 the concrete block fails and is utterly destroyed. As far as I am concerned we are at about 2 minutes and 30 seconds with respect to the electrical grid. In order to understand what I believe to be the serious risks facing the electrical generation and distribution system it is necessary to review the structure of the system as it was before renewables began to be developed in a significant way. 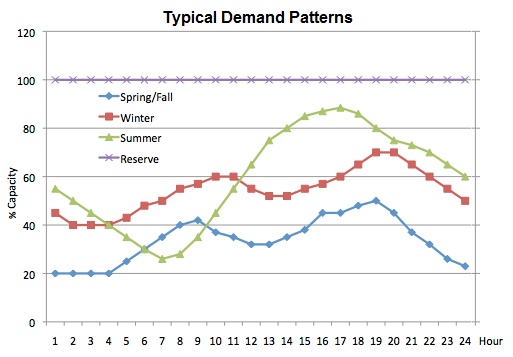 The chart below shows hypothetical load profiles for a peak demand day during the spring/fall, winter and summer as well as a line that represents the overall generating capacity in the system. It can be observed that the system demand/load varies considerably throughout the day and throughout the year. It is also clear that there is a great deal of excess supply available for most hours on most days. In fact, only on the highest peak demand days of the entire year will the demand come close to the supply. That is by design as every well-managed electrical generation system in the world requires a reserve margin of 8-15% above peak demand. This reserve is meant to provide resiliency for the grid to accommodate scheduled maintenance shut-downs at major facilities such as nuclear plants, natural gas-fired and coal-fired plants as well as unscheduled outages due to storms or switching problems or other operational issues. So before we began to develop renewable energy there was plenty of generation capacity within the system. In fact, many generation facilities were not running at anything close to capacity most of the time. Because of a public policy decision to reduce the burning of hydro-carbons (and the associated production of CO2 emissions) wind and solar generation sources have been subsidized through a variety of financial instruments including capital grants, tax credits, and feed-in-tariffs. Renewables have also been given preferential access to the grid in most jurisdictions. These measures have achieved the stated policy goal. Wind and solar now make up a significant percentage of generation capacity in a number of jurisdictions and at times provide a large percentage of electrical production. For example, Germany has developed over 30 GW of solar power and over 30 GW of Wind. On a blustery spring day in Germany renewables can meet up to 40% of the total electrical demand for a few hours at mid-day. There are regular announcements of "new records" for both solar and wind generation. A similar situation exists in Texas with regards to wind and in parts of Hawaii with regards to solar. Remembering that there was already a surplus of generation capacity in the system before the development of renewables it is obvious that when renewables hit their generation peaks most traditional thermal generation plants are unable to sell electricity. That would not be a problem if the construction of these plants had not been financed based upon assumptions regarding how often they would be used and what wholesale electricity prices would be. In fact, the economics of running these plants has deteriorated to the point where many utilities, especially in Europe, are on a "credit watch". The rational response of companies trying to sell electricity into a market that has a great over-supply would be to decommission some of the oldest and most polluting plants to bring supply and demand into a better balance. But there is a problem. Renewable resources cannot be relied upon, particularly at peak demand times. The chart below displays the wind resource available compared to the demand curve for a week in November, 2013 in Texas (this week was not chosen on purpose to make wind look bad. It was literally the first file I found on the ERCOT site when I was starting to write this blog). In this situation demand rose throughout the week as a strong high pressure system spread across the state bringing with it colder temperatures while at the same time shorter days required more lighting. One of the more troublesome realities of meteorology is that large, stable high pressure systems are often responsible for peak electrical demand in both winter and summer because they are associated with clear skies and temperature extremes. These systems are also commonly characterized by very low winds across a wide area. 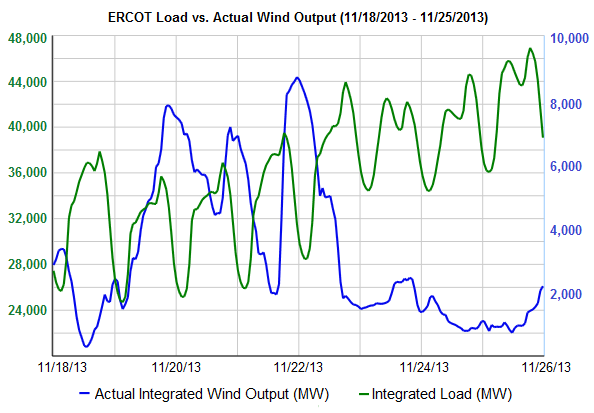 As a result while demand continued to climb wind energy faded away to almost nothing. At this point most of the thermal generation assets available within Texas had to come on-line in order to meet demand. So it is impossible to decommission even the oldest and least efficient thermal generation plants in the system regardless of how many wind farms have been built and solar panels deployed. German utility E.on came face-to-face with that reality in the spring of 2013 when they were instructed by the local grid operator to keep an old plant operational even though it would rarely be needed. But a new day is dawning in the U.S. and it could be a darn cold (or hot) one. The EPA announced regulations in December 2011 that will require coal-fired thermal generation plants to clean up or shut down. The reality is that for many of these plants it will not be feasible to clean them up. In fact, in some cases the EPA will not even allow them to be updated with modern pollution controls. As a result more than 30 GW of firm generation capacity will be decommissioned over the next several years. Plans to replace this loss are in some cases vague and have been changing often. Increased conservation and better utilization of existing plants are frequently included in Integrated Resource Plans. In other cases greater reliance upon renewables is explicitly identified. These are not really replacements for firm capacity. A number of new Natural Gas fired plants are also under construction. While current low gas prices make this an attractive option the threat of future significant price hikes as well as the EPA's stated goal to regulate CO2 emissions are worrisome and are impacting the ability to secure financing of these plants in some cases. As more and more coal-fired plants are retired it is likely that total system firm generation capacity will drop resulting in smaller reserves. This, in turn, will make the system more susceptible to storms or other unplanned outages. The degree to which grid security is compromised will vary from region to region depending upon the penetration of renewables, number of coal-fired plant retirements and the health of the local economy which has a major impact on electricity demand. Based upon those factors I believe Texas and the Mid-west are the areas most at risk. It may be that the reduction in coal-fired generation will do nothing more than cull excess capacity out of the system with no negative impacts. But groups such as the Institution of Engineering and Technology in the UK have issued warnings about the progressive stress on a system that has taken decades to evolve and is now faced with unprecedented challenges. Like the concrete block in the Youtube video the system is not displaying any outward signs of weakness. The question is this – will the North American electricity system encounter its own version of second 2:41?